11 pound unstuffed, thawed turkey, giblets and neck removed. Notes: If you are NOT brining your turkey, make sure to salt it. If the turkey is brined, DO NOT salt it further. Remember: brined turkeys cook faster than unbrined, so you may need another hour for your unbrined turkey. 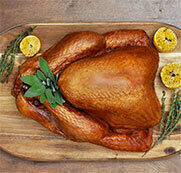 For cook times, check out Canadian Turkey's guide. I used Canadian Turkey's brining method this time around! Pat turkey completely dry from brine and allow to sit, uncovered, in refrigerator overnight if possible. Place turkey into a turkey roasting pan. Add about 2 cups water to the bottom of the pan. Place pan into oven, reduce heat to 350F, and roast turkey for 1 hour, uncovered. Remove from oven, baste turkey with pan drippings, and return to oven, uncovered. Continue cooking for about 1 hour, basting every 20-30 minutes, or until turkey breast reaches 165F. Remove from oven, cover, and allow to rest for 15 minutes. In a small saucepan over medium heat, add oil. Once hot, stir in ginger, Thai pepper, and garlic. Cook for 3-4 minutes, or until aromatic and browning, but not burnt! Stir in soy sauce, oyster sauce, brown sugar, 4 basil leaves, and 1/2 cup broth. Bring to just a boil, reduce heat, and simmer for 5 minutes. Combine cornstarch and remaining broth. Stir into saucepan and simmer for 10 minutes, or until sauce has thickened. Remove from heat and stir in basil chiffonade . 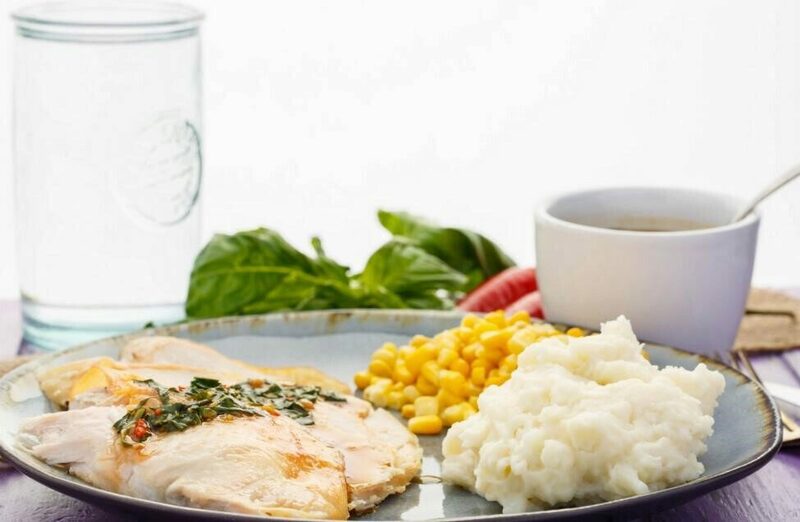 Slice turkey and serve with Thai basil sauce!